Democrats had such high hopes just weeks ago that they would recall Governor Scott Walker and oust him from office. But their dreams are fading fast. With just two weeks to go before the election, Governor Walker holds a six point lead in the latest Marquette poll. This past weekend the Milwaukee Journal Sentinel, by no means a conservative paper, endorsed Scott Walker in the governor's race. 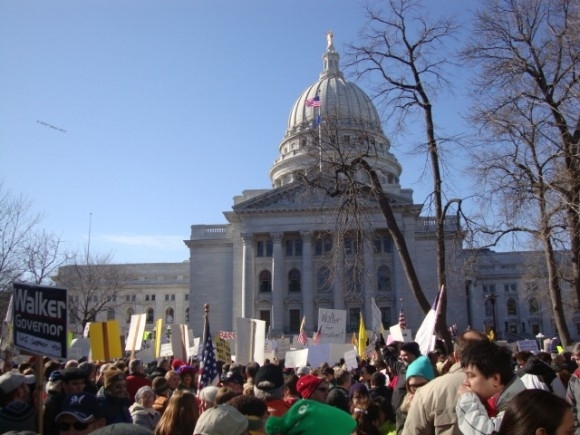 Last February THOUSANDS of Tea Party Patriots turned out in Madison, Wisconsin, to support of Republican Governor Scott Walker. The tea party still supports Scott Walker. And, there is more good news for Governor Scott Walker and Wisconsin. The reforms passed by Governor Walker and Wisconsin Republican lawmakers saved the state one billion dollars. While a lightning rod for controversy and recall, Wisconsin's Act 10 has paid significant dividends to taxpayers, according to a new analysis by the Beacon Hill Institute for Public Policy Research, at Suffolk University in Boston. What the analysis found is that without the law, which in part requires covered public employees to contribute more to their benefits and holds wage increases to the rate of inflation, Badger State governments would have been forced to raise taxes or make deep job cuts to meet budget expenses. As it was, Gov. Scott Walker and the Republican-controlled Legislature pushed through reforms and reductions that filled a $3.6 billion budget shortfall, although organized labor asserts Republicans balanced the budget on the backs of public employees. The measure drew the ire of organized labor and the Democratic Party, with tens of thousands of protesters packing the Capitol. Ultimately, it was the Walker-led reforms that launched a recall campaign in which the governor in two weeks must defend his term at the polls, facing Milwaukee Mayor Tom Barrett in a historic gubernatorial recall election. The Beacon Institute analysis argues the law may have been controversial, even divisive, but there’s no disputing its benefit to taxpayers. The vote is two weeks away. Let's all do what we can to help move Wisconsin forward.